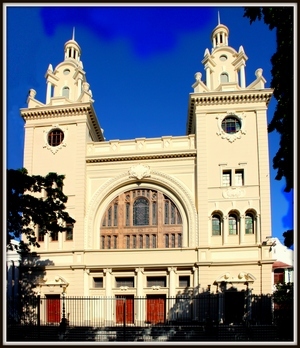 The Gardens Synagogue consecrated in 1863 was the first in South Africa. Situated in Paddock Avenue in the Gardens. It’s design is a simple temple form with a stone and plaster front and an unusual mixture of Greek and Egyptian motifs for decoration. Six tall, smooth columns, the outer pairs coupled, stand on high, square panelled plinths. Their capitals and lower mouldings are a mixture of decorative acanthus and palm leaves and lotus flowers. They support an empty pediment with decorative classical mouldings. Over the entrance door is an interesting hood of a decidedly Egyptian aspect. The first Hebrew Congregation met in 1841 at Helmsley Place in Hof Street, the home of Benjamin Norden, an 1820 British Settler. The “Old Shul” as it is now called, is a typical example of mid- Victorian architecture. In the interior, the apse behind the ark enhances the charm of the building with its stainedglass windows (installed in 1884 on the occasion of the loath birthday of Sir Moses Montefoire, who had assisted in the establishment of the synagogue). The Ark is a copy of the one in the so-called Obbene Synagogue in Amsterdam, shown on an etching dated 1727. From 1881, the influx of East European (Russian and Polish) Jews began to arrive. They were refugees from pogroms, economic hardships and prolonged military service. Most of them passed through the Poor Jews Temporary Shelter, which had been set up in London by the London Jewish Board of Guardians and spoke Yiddish and little, if any, English. As it was relatively inexpensive to live and work in District Six, so many of these so-called ‘litvaks’ gravitated there that it was sometimes referred to as the Jewish quarter. They built synagogues as soon as they could: the Beth Hamidrash in Constitution Street was consecrated in approximately 1897 but many smaller places of worship were established in houses or rooms. Groups of Landsleit – people from the same towns and villages in Eastern Europe – attempted to maintain their identity, forming their own congregations and Landsleit societies. Today it forms the entrance to the Jewish Museum. 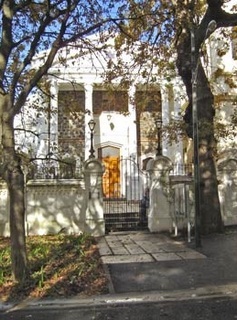 In 1941 the centenary year of the Cape Town Hebrew Congregation, a society to establish a Jewish Museum and Archives was founded in Cape Town. Its main object was to collect and preserve articles and documents, illustrating the history of the Jewish community in South Africa, but the project made slow progress, and it was not until August 1958 that the museum was opened officially. Several items of ceremonial silver, which were recovered from the Nazi loot in Europe, have been loaned and private collectors have also presented exhibits. In 1905 most of the fittings were dismantled and moved to the adjoining Great Synagogue, where they can still be seen with their design carved to match the cast-iron work of the gallery in the Old Synagogue. The Great Synagogue stands alongside the old Synagogue. The architects Parker and Forsyth designed this twin-towered, domed, baroque styled building. The building was consecrated by the Rev. A P Bender and opened by the Mayor Hyman Lieberman, on 13 September 1905. The new South African Jewish Museum was completed in August 2000, at a cost of R9 million. It comprises an area of 1227m2, and is one of the most state of the art museums in the Country. The concept of the Israeli museological team, comprising Harel Design and Renee Sivan, required that the existing Old Synagogue be coupled to an entirely new building. The Old Synagogue would house a collection of original Judaica. The new structure would house the museological zones of ‘Memory’, ‘Reality’ and ‘Dream’. Together, these linked areas would comprise the new museum. The Museum celebrates the historical role of the Jewish Community and its ongoing contribution to South Africa, using modern museological techniques available. Touch screens and interactive computers stand side by side with a peddler’s cart. Documentary films and newsreel footage are shown alongside a 19th century Lithuanian village. It explores the old world that the Jewish pioneers left behind and recognize the new one that they discovered. 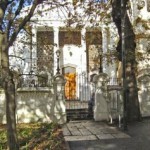 It is located at 88 Hatfield Street (an extention of Plein Street), in Cape Town, in the precinct of the Great Synagogue of Hatfield Street. It falls within the historical ‘Museum belt,’ centred on Van Riebeeck’s Company Gardens. The museum forms part of a unique and non-exclusive campus of related community activities such as the separate Holocaust Centre and Gitlin Library. A restaurant, museum shop, community centre and conference centre are also located on the campus, as well as a number of religious buildings including a Succah, the 1905 Great Synagogue, and the historic Old Synagogue of 1863.